William and Charles Fields came to Cedar Falls in 1873, where they purchased 960 acres of land west of town and began a prosperous stock breeding farm. In addition, they founded a bank in Cedar Falls, with William as president and Charles as cashier. The farm grew in size to 3,000 acres, employing as many as 30 people. The brothers raised shorthorn cattle, Berkshire and Poland China hogs, and Cotswold sheep, as well as Cleveland Bar and English Shire horses. The three barns on the farm housed as many as 200 work and thoroughbred horses, worth more than $200,000. The financial panic of 1893 cost the Fields brothers their bank and much of their fortune. They remained in Cedar Falls until 1906, when they sold the farm to George Uhl. 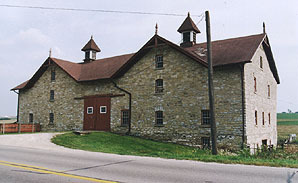 Uhl's son, Marshall, is the present owner of the farm and its handsome fieldstone barn, which is listed on the National Register of Historic Places.